A member of the Empyrean Royal Guard. Empyrean law mandates that each female child take a test before her fifth birthday. Those who demonstrate exceptional talent are then able to enter into extensive training, prepping them to join an elite division of the Imperial Guards called the Imperial Princess Garden. Women of this privileged minority end up not only defending Empyrean from its enemies, but also playing leadership roles in their societies, lending their expertise to all sorts of technology, from instruments of war to vital communication technologies. While very similar to the Male Gunner, there are various subtle differences, including height, which may affect various skills. Focuses more on melee combat when compared to her male counterpart, the Female Ranger is able to dart into and out of groups of enemies with the Gunblade's Rush Blade, Rainbow Kick, and Air Blade. Chain Powder is able to augment her cube skills for a period of time on a short cooldown to better suit her melee combat style. Once awakened, the Female Ranger focuses even more on melee combat with Veiled Cut, causing additional damage and Bleed (Status) with every melee skill. Similar to her male counterpart; she focuses more on her flamethrower weapons and some air play. Favors the G-Series more than anything, the Female Mechanic is able to cycle through and keep up her G-Series indefinitely with a focus on sustained DPS, and can deal increasingly greater amounts of damage through G-Extension once awakened. The Female Mechanic is able to deal Light damage with her skills through Transformation, compared to her male counterpart's Firebolt which deals Fire damage. Focuses more on air attacking and grenades when compared to her male counterpart, the Female Spitfire is able to rain a barrage of bullets and grenades from above with the Nitro Motor, and can even throw M18 Claymore mines while in flight. The Female Gunner must first reach level 15. Clear Full Moon Thunderland to advance as your desired subclass. For help deciding on your character, the Class Comparison tables have side-by-side class and subclass comparisons. 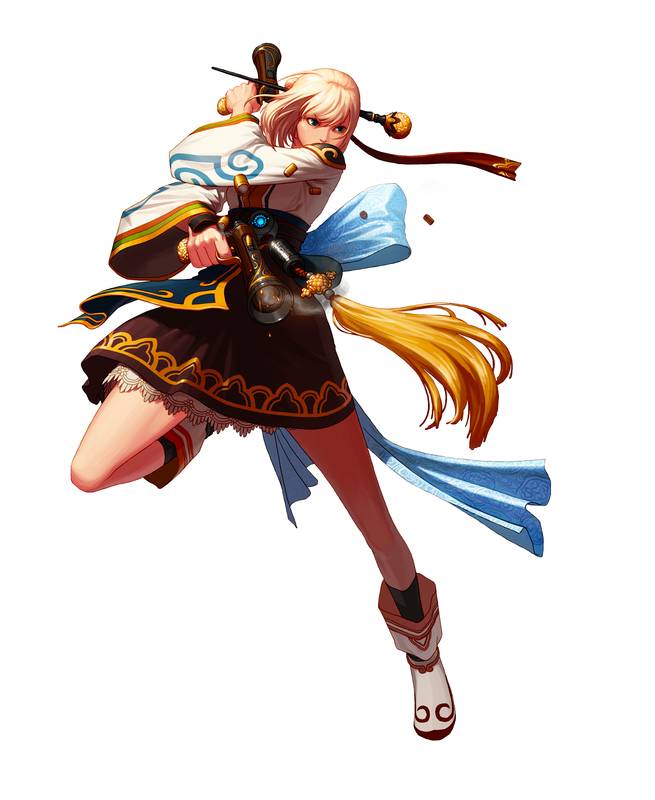 The Female Gunner is also a playable character within the 3D side scrolling RPG game Elsword, made by KOG Games Inc., making her the first character in Dungeon Fighter Online to be cross-promoted by a different developer. In the game, she is named Rose.